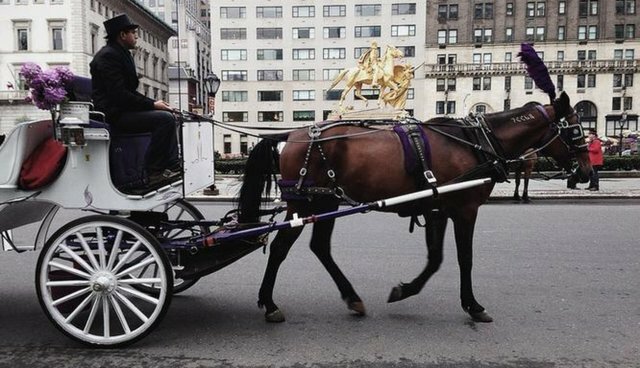 A horse carriage driver's attempt at revenge against Mayor Bill de Blasio's plan to phase out horse carriage rides didn't quite go as planned. Peter Fayolle, 57, was charged with "criminal mischief," reports the New York Post, for allegedly carving "F-U" into what he thought was a New York Police Department vehicle. It turned out that the car Fayolle was charged with defacing actually belonged to CBS medical correspondent Dr. Max Gomez. Dr. Gomez told The Dodo that he had parked on the street overnight and was surprised to find his car vandalized in the morning. "I didn't even know he was a carriage driver until I saw it on the news," he said. "I thought it was just one of those New York things." Fayolle claimed he was being unfairly targeted because de Blasio doesn't like horse and carriage drivers, police said. The horse carriage industry in New York City has a longtime rivalry with animal rights advocates, who argue that forcing horses to walk alongside city traffic is cruel and dangerous, and there isn't sufficient legislation in place to protect the rights of working horses. De Blasio's bill ending the carriage industry doesn't mean that carriage drivers would necessarily be out of a job - but some, like Fayolle, may not be jumping to get their green taxi licenses.